However, many of the Mediterranean island’s winemakers learned from their mistakes, put an emphasis on quality over quantity and began turning things around by the 1990s. For almost three decades, they’ve been producing excellent wines from native grapes grown in volcanic soils and ripened in Sicily’s warm, dry climate. In 1987, Pietro Colosi Jr. teamed up with his father, Pietro, to begin making quality wines in Sicily, which are now exported around the world. Colosi Bianco, the family’s white table wine, produced by winemaker Pietro III along with his father, Pietro Jr., is fine for drinking any time of year, but it’s particularly good when the calendar says it’s officially spring and warmer days are in sight. The wine’s crisp, complex layers of floral and fruit aromas and flavors are reminders of warm, brightly colored, sun-filled days, and convivial evenings around an outdoor dinner table with friends and family. Colosi Bianco is an inexpensive, widely available wine that’s a good accompaniment to appetizers and a perfect match for fish or shellfish, as one would expect of a wine produced on a Mediterranean island. Cantine Colosi is located in the volcanic Aeolian archipelago on the island of Salina, where the family cultivates about 25 acres of vineyards. The eight islands north of Sicily were listed in 2000 by UNESCO as a World Heritage Site, and they are under architectural controls that restrict the construction of new buildings. Because of the regulations, the Colosi winery and cellar, built in 2004, is disguised by grape vines and mostly underground, which keeps the cellar at optimal temperature for storing wine, the company’s website says. For the Bianco wine, Colosi contracts with growers on the west end of Sicily in the Marsala sub region of Sciacca. The grapes are hand-picked in the “second decade” of September and transported to the east side of Sicily to the Messina region where the company has a winery and bottling plant in Giammoro. With his father’s help, Pietro Colosi III oversees every aspect of the wine production process, from vinification to bottling, and is actively involved in marketing and exporting Colosi wines. 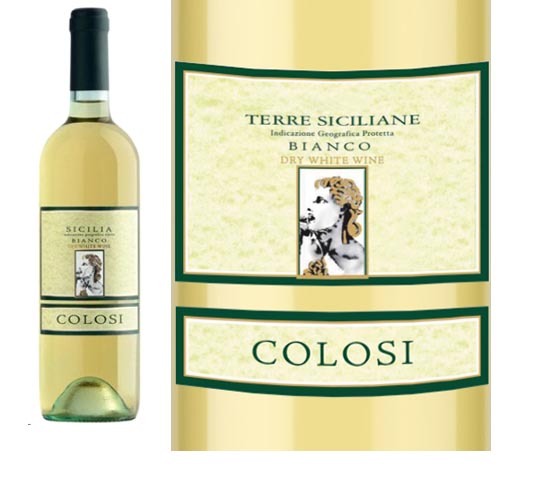 To make the Bianco, Colosi uses a blend of 40 percent Cataratto grapes with 40 percent Inzolia and 20 percent Grillo. These are all native grapes, grown organically, and they give the wine flavors of white peaches, citrus and exotic fruit, the tasting notes say. The wine is aged in stainless steel tanks until the end of January, then aged in the bottle for three or four months before being released. That means the 2017 vintage should be arriving in stores around New England in June. But I checked recently, and there is still Colosi Bianco on the shelves, particularly in Vermont. Colosi also sells two excellent red table wines, a Nero D’Avola and a red blend, both made from native grapes. Those wines are even more widely available, great bargains and well worth trying. Wine has been made on Sicily since at least the eighth century B.C. when the Greeks were hanging out on the island. Because of the dry climate, ocean breezes and sparse rainfall, Sicily’s wine grapes avoid the mildew and diseases that plague fruit grown in other parts of the world. As a result, for many centuries the island produced excellent wines that were sold as far abroad as ships could take them. Sicilian winemakers grew their grapes on vines trained like bushes, and the vines produced low-yielding grapes with intense flavors that made exceptional wines. In 1960, the regional government decided since Sicily was making such good wine, that more grapes would produce more great wine and everybody would make more money. The government offered incentives to the growers to abandon the traditional vine training system for high-yielding wire training. Most of the growers took the bait, Jancis Robinson writes in The Oxford Companion to Wine. For more than 20 years, the high-yielding vines produced grapes that had little or no flavor, resulting in a lot of Sicilian wine that was thin, flavorless or just bad. The bad wine was impossible to market, and in 1987, many of the growers saw the light and switched back to the bush-trained vines. Colosi uses the traditional training method. The Colosi family makes good wines; check them all out, particularly the Bianco. It’s a great bargain, and its flavors will remind you of the warmer days that will surely come.